Our third time of seeing Marcus Bonfanti. I have a suspicion that Mary's work travel plans were geared round this as the tickets were booked a way back. I had "team building" drinks after work followed by a stroll through Green Park and up through Mayfair. I grabbed a quick pasta meal in Stef's Restaurant in Berner Street - an excellent fresh tagliatelle carbonara and a glass of red wine. Mary arrived just as I was finishing and off to The 100 Club. 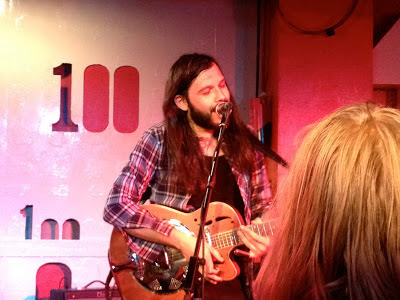 "The 100 Club lived up to its historic roots, providing a great night of alternative music. Not something to be undervalued amongst the money spinning streets of commercial London, the club is always a place of solace for music lovers. 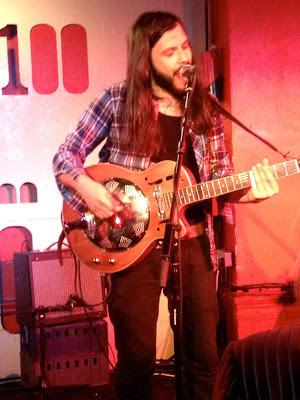 All in all, great music, great venue and Marcus Bonfanti is a true inspiration of UK music and definitely one to watch for the foreseeable future. We would urge you to go and see him as often as possible. We know we will." Then a taxi home as we'd had a couple of beers and couldn't be bothered with late night tubes and trains. Greeeeeen with envy!! I'm still waiting for Marcus to arrive in Nashville and set the south on FIRE! Cheers to great music!! !